Place a 2-by-2-inch piece of scrap clay on a glass dish or silicone baking sheet. Push the blunt ends of two stick pins into the piece of clay so they stand upright and are evenly spaced apart. Using your hands, fashion two spheres from white polymer clay. These are going to be the eyeballs, so try to keep their diameter in scale with the head on your sculpture. Put the spheres of clay on the exposed tips of the stick pins. Be careful not to distort the spheres' symmetry while pushing them onto the pins. Bake the spheres on the glass dish in your kitchen oven, using the time and temperature specified on your polymer clay directions. Remove the spheres from the oven and let them cool. Use these spheres as the eyes in the face of your clay sculpture. Set them midpoint between the top of the forehead and the chin. Shape the clay to form a face around the spheres. Bake your clay sculpture according to the clay manufacturer's specifications and let it cool. Use a fine-tipped paint brush to apply black acrylic paint for the eyes' pupils. 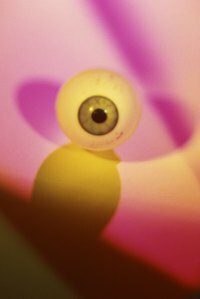 To look realistic, the pupil should be about a quarter of the size of the sphere's diameter; for example, if your sphere is 2 inches wide, paint a 1/2-inch-diameter pupil. Position the pupils depending on where you want your figure's eyes to be looking. Allow the pupils to dry completely before continuing. Paint around the pupils with a colored enamel to create the iris. The total width of the iris, including the black pupil in the middle, should be half the total width of the sphere; if your sphere is 2 inches wide, you need a 1-inch-wide iris. Using a slightly different shade of the colored enamel, add flecks to the iris to create a more realistic eye. Allow to dry. Apply a small amount of clear nail polish to the sphere to create a shiny cornea. Allow to dry. I like to use a metallic acrylic paint for the iris of fairy sculpts. You can bake a number of spheres at once to use as tests for color and technique ideas. Do not bake your clay after you have painted it or applied fingernail polish. The chemicals may produce dangerous fumes or ignite.